So, the genesis for this blog was my first blog “In Search of the Perfect Burger”, which all began with a meal at Mr. Bartley’s Burger Cottage. While eating there with our girls (roughly on August 5, 2008), I saw a map by the door, from the book Hamburger America. As soon as we got back home, I went on Amazon and bought my first copy, which became my “burger bible”. That first edition had 100 of the best burgers from across the country, according to George Motz. I created a list from that book and began “checking off” burgers, as I traveled for work and on vacation. 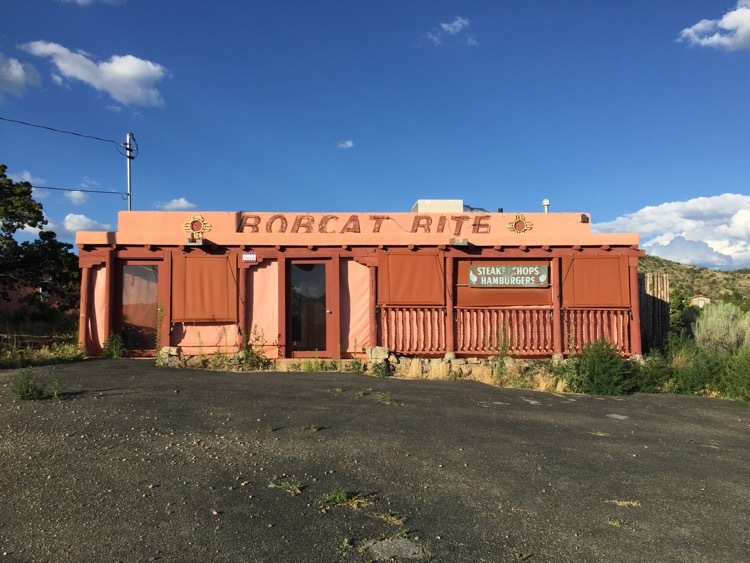 The only entry in that tome in New Mexico was Bobcat Bite. 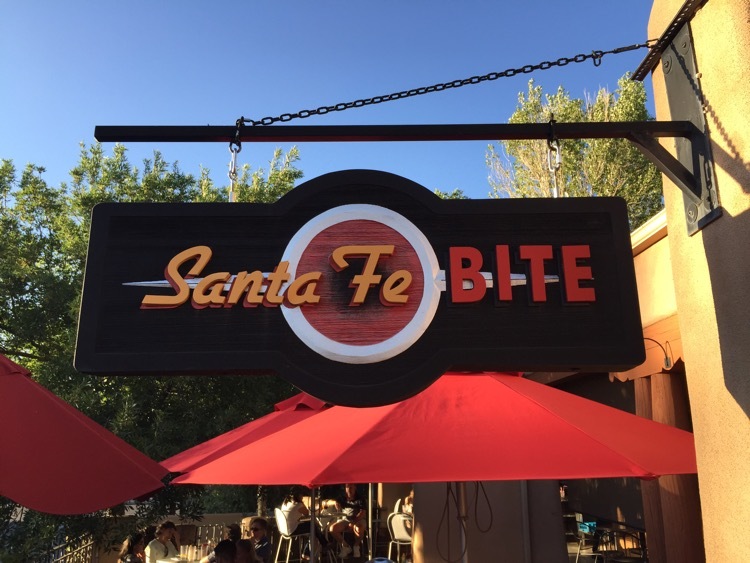 When we planned to spend the night in Santa Fe, I knew where we were having dinner. I plugged the address into my GPS and off we went. As we pulled into the parking lot, I felt the wind go out of my sails. We arrived around 7:30 and were seated at a table near the entrance to the restaurant. 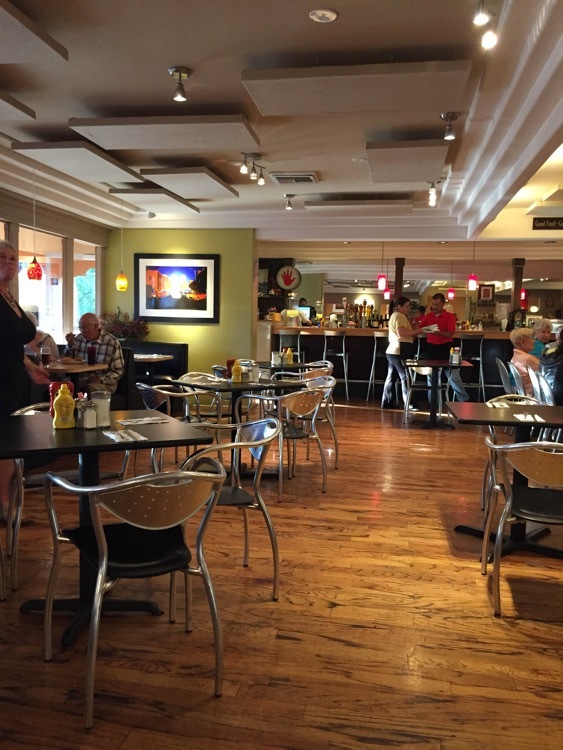 The restaurant certainly went through an upgrade with the name change – moving into the city, looking considerably less rustic and quadrupling (at least) the 24 seats at the Old Las Vegas Road location. The menu was broader than I expected, with a variety of burgers and steaks along with enchiladas, flautas and (according to my wife, some very tasty) tacos. I ordered the burger I had on mind before we left home – and the signature dish of New Mexico – a (10 ounce) green chile cheeseburger. 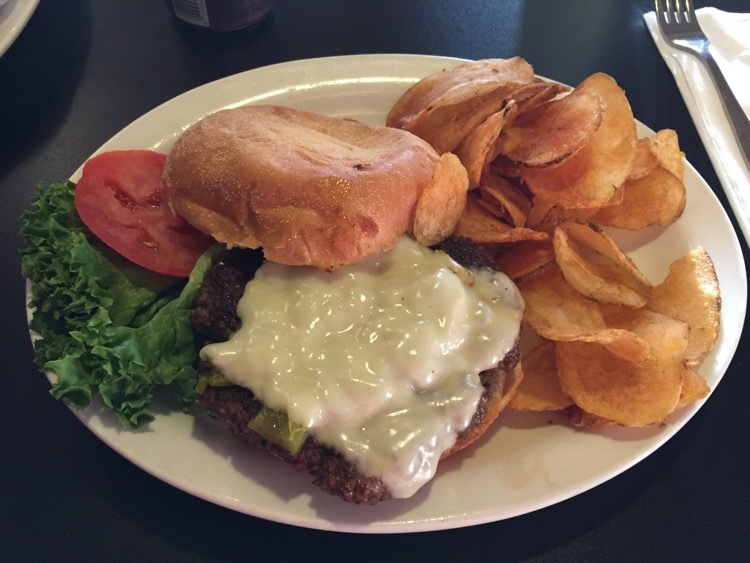 The burger was served with chips, as opposed to fries – this was the common side I noted at a couple of NM burger places. The sliced green chiles under the cheese weren’t over-powering, but added “heat” to every bite. This was a very good burger – I’m glad I got to try one. Before we left, I told John that I had that burger on my list for eight years and that I really enjoyed it. He replied that he was glad that I wasn’t disappointed.